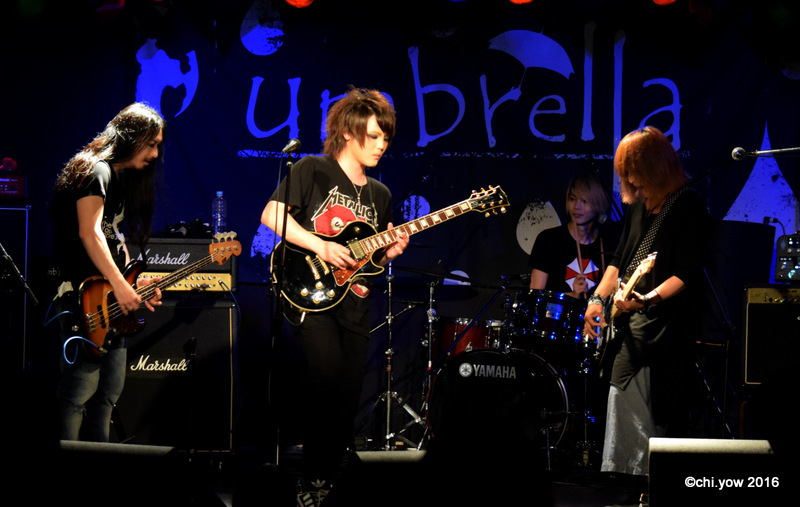 LIVE REPORT: umbrella @ TOGATOGA [Saikai] | VKH Press – J-Rock & Visual Kei Coverage Worldwide! 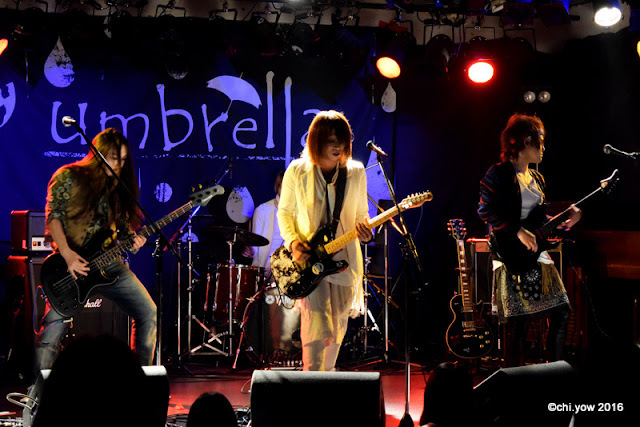 To encourage fans to attend as many of stops of Chapter.2, their three-city one-man single release tour, umbrella held a stamp rally of sorts, with the first collection point being their Umeda AKASO concert back in September of 2015. With four stamps in total, any combination of three granted entry into a free late afternoon live, while completing the stamp card allowed fans to attend the evening portion as well. 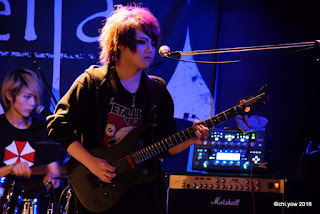 The free lives took place on April 28 at Kyoto Toga Toga, a small bar and club that made for a more intimate atmosphere. Fans could choose to either sit in the arranged chairs to order and enjoy the venue's food and drink, or leave their belongings in order to find a place in the space in front of the low stage. Within the limited time, umbrella played a mix of nostalgic songs from past releases as well as more recent material. After the members passed through the crowd to take the stage with "Lumiere" playing from the speakers, the first session opened with "Shinkaron" for a chill and mellow beginning. umbrella then built up the tempo with "Eikyu Chizu", which started with a blast of guitars that wound their way throughout the composition to set an aggressive, yet controlled pace. 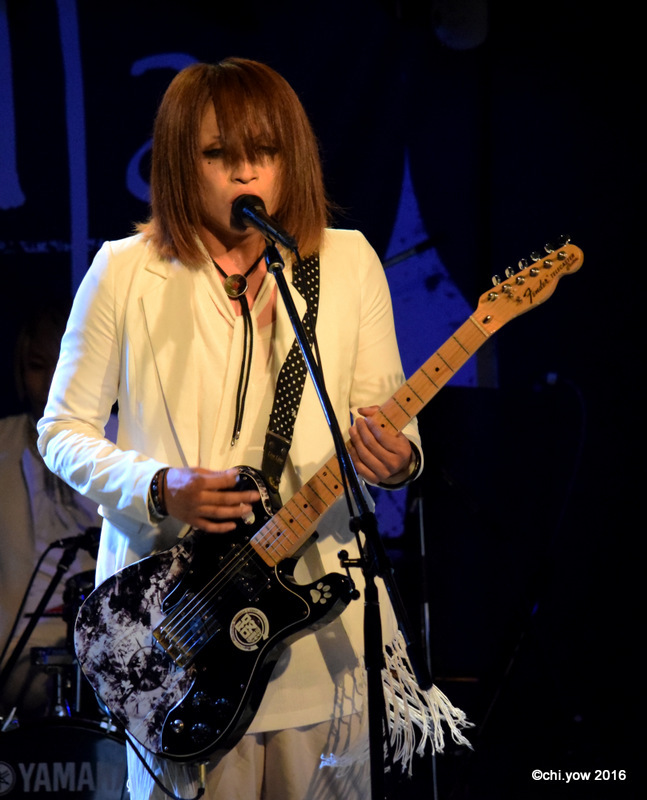 Guitarist-vocalist Yui kept his voice in the lower range for the first two songs, playing off the intense atmosphere built by "Eikyuu Chizu", before the heavy synths and distortions in "Gizagiza Kairo" brought even more heat and energy. During a small break to thank the attendees for having come to today's live as well as at least three others within the past nine months, bassist Hal also asked the other members for their strongest impressions from the tour. Drummer Sho commented about the Tokyo date being extremely rainy, “The others were kind of too, and even today, but not like Tokyo.” “Well, Sho is the only hare otoko (‘sunny weather man’) in this bunch, while the three of us are ame otoko (‘rainy weather men’) so what else would you expect!” Hal’s comment brought a round of laughter from the audience, but he wasn’t finished entertaining the crowd yet. As guitarist Shu’s turn to take the mic came, the bassist brought up the band’s usual one-man joke of Shu leading a joint call of "Ongaku…saikou!" However, this time, there was an additional twist; “Let’s try English today!” Hal enthusiastically proposed, to Shu’s audible disbelief at the unexpected turn of events. While a call of "Music is…wonderful!" was carried out in high spirits, Shu soon after commented that it really was difficult, perhaps because of the "r" and "l" and the additional syllable in comparison to the Japanese, which was also done as the English version had not gone as smoothly as hoped. Hal used his time to thank those who were responsible for the enormous rose arrangement to honor his birthday that would be in two days’ time. Yui then went on to explain the ideas behind each of the tour date’s naming: the venues were chosen to match with each title for Chapter.2. In Tokyo’s case, CHELSEA HOTEL was considered the perfect setting for a Mikkai (secret meeting), Nagoya’s HOLIDAY venue was a place to take a breather or Toiki (sigh) because life can be hard, although partying too hard at Osaka’s Club Vijon can lead to a sense of Memai (dizziness). After an extensive journey, it felt fitting to have a Saikai (reunion) at favoured venue Kyoto Toga Toga. "Zouka" restarted the live, with Yui drawing out the first line dramatically before the instruments powered in. The synth-laden "Taiyo kousen" followed shortly after, gradually bringing the tempo back down while injecting a somewhat bubbly, yet melancholic air to the live atmosphere. This carried over to "Binetsu," the mellow tune featuring a mix of Yui’s wailing vocals and a steady drumbeat from Sho that made for a smooth transition into "Higashi e." The live finished on a rowdy note as the heavy guitars of "Toumei" blasted through the speakers. 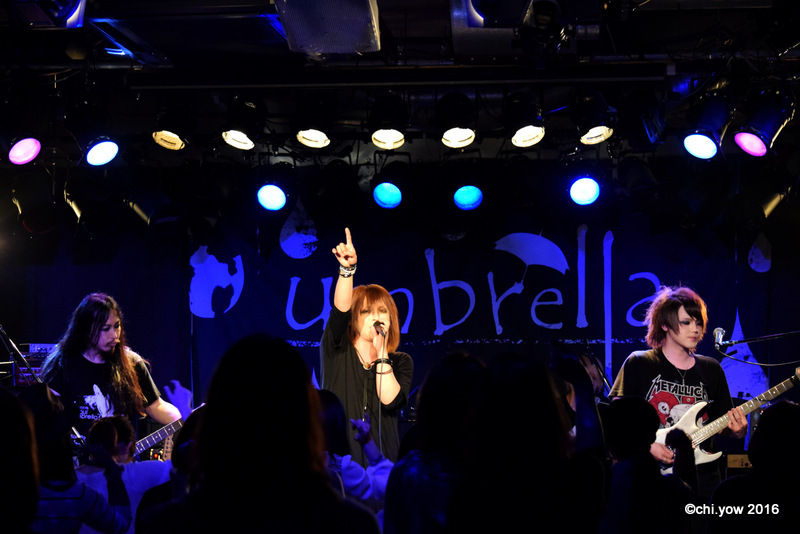 After only an hour break, umbrella took the stage for the second round in their casual wear for an especially relaxed atmosphere. The quartet thanked the audience members for having attended all four one-man lives required to participate in the both of the day’s lives, as well as for coming to both. In addition to the relatively rare sighting of a visual-kei band on-stage sans costumes, umbrella decided that the setlist would also better reflect each individual’s personalities. Each member chose one of their favourite songs to date from their discography, adding commentary related to their respective roles in the band (i.e. Sho sharing information of different types of drums). After their personal best selection, every member added a song from other artists that they liked to cover in the set, with each presenter taking over the vocals for their choice of cover song. The second of the free lives started with a group reflection of how their music had evolved over the years. Sho shared that he generally preferred songs with simpler rhythms, especially in regards to performing as simpler rhythms meant that he would able to play longer. “Well, guitar solos are really well-liked, so it is unfortunate that not many people pay attention to the backing drums. This is especially true in the visual kei world.” Shu added some input after it was commented that the guitarist tended to create songs with speedy tempos. This then led to a bit of a showcase of Sho’s current drum equipment, the explanation of how different drum pedals affected the speed of output from bass drums, how the type of drumstick could change the sounds produced, and other notes of how the best balance of drums can be created for each individual. Speaking of individual preferences, it was Sho’s choice of "[Tsuki]" that opened the musical portion of the live. This piece is occasionally referred to as the band’s "greeting song," and is quite popular with its calming and melodic tunes in addition to being one of the few songs that tends to feature vocal additions from all of the members during the chorus. For Shu, it was "Samidare" that he chose to add to the setlist of the evening. “But actually, we had already finished recording ‘Samidare’ when your audition came about, huh? By the way, this guy’s audition was really strong!” Hal was quick to note and share additional details with the fans: “Well, around the time that ‘Samidare’ was released, that was actually the kind of music I really wanted to play. My previous band had always played harsh music, and it was good for a while, but eventually my motivation went down.” Fortunately for both parties, the timing of line-up changes seems to have worked out well, although Hal also added that the song has transformed a bit since the initial recording, with the initial guitar work being set in the higher ranges, prompting Shu to demonstrate the differences of the intro before launching into the full play. “As for me, I want to say that I like ‘Haikei, amebiyori’!” Hal’s declaration was evidently the cue for Yui to retreat from the front to ready a towel, much to the amusement of the crowd. In regards to the song itself, Hal shared that it was made with the idea of playing with more interesting melodies, possibly even karaoke-friendly in the future. The bassist followed up with a showcase of different bass playing techniques, claiming that he preferred to always use a pick, demonstrating the difference between the usual picking technique versus down-picking. He also noted that one of the differences between bass makers can be the distance placed between strings, and likely would have continued on a similar and ever-expanding note had he not realized that he had lost a good majority of the audience in the increasing technical aspects. “How about you just use down-picking when you play today to better show the difference?” came Shu’s suggestion, which was taken as they started into the cheerful number. “This isn’t necessarily an old song, but it’s still one that has a story behind it.” Evidently, during the creation of mini-album Kinematograph, working with Danger Crue, their assigned producer essentially banned the inclusion of ballads in the release. Possibly because of this seemingly random restriction, "Zouka" had actually been the first to make it to the tracklist, but it was also thanks to this rule that "Keihaku na hito" was created the way that it came out. “It’s a song that we put a lot of thought into, because ballads were ‘not good,’ and we were also debating whether or not to split the release into two singles, or even a type A and B with different tracklists. “But in the end, we just have one version of Kinematograph, nice isn’t it?” Although time did not permit for a full play-through of the mini-album as they did at the release event back in June, the audience was perfectly content with the violin-laced "Keihaku na hito" being Yui’s personal addition to the set. With the "personal best" finished, next came the covers. (“It’s our first time doing this, isn’t it?”) First up for the second half of the live was Shu, choosing "Hito ni yasashiku" and switching places with Yui to take the main microphone for the temporary dual role of guitarist-vocalist, as well as hiking up his guitar to wear in a high fashion (as other well-known guitarists seemed to be apt to do). Second to don the instrumentalist-vocalist role was Hal with "Kanashimi no hate." The bassist commented that the vocals were actually relatively high, which was not something he was particularly skilled at hitting. “But, I will do my best!” he said, and he did, earning a spirited round of applause as the last notes faded. “It’s probably not that well-known, but it is a song that I really like.” This was one of Sho’s points to convey in introducing his cover song of choice. 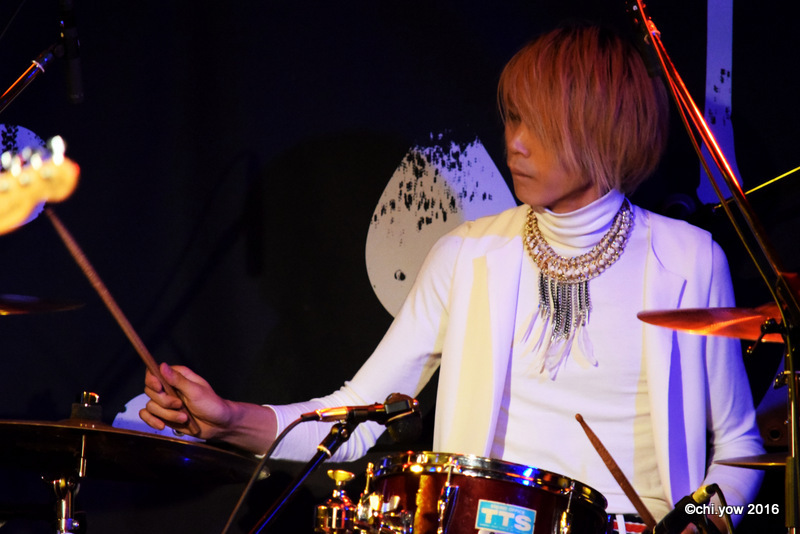 After adjustments were made to his mic in order to better carry his voice, Sho took on the challenge of performing a drummer-vocalist version of "Miss Rock n’ Roll." While the instruments still unfortunately drowned out his voice a bit, the drummer didn’t let that discourage him, keeping in high spirits until the end. 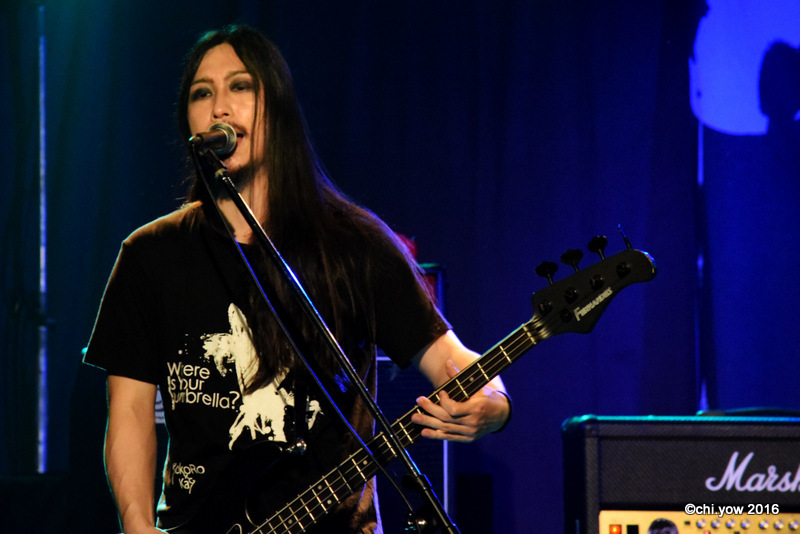 Yui then presented his rendition of "Momen no handkerchief," making use of his wide range of vocals to maintain singing in a higher range for the duration of the last cover. 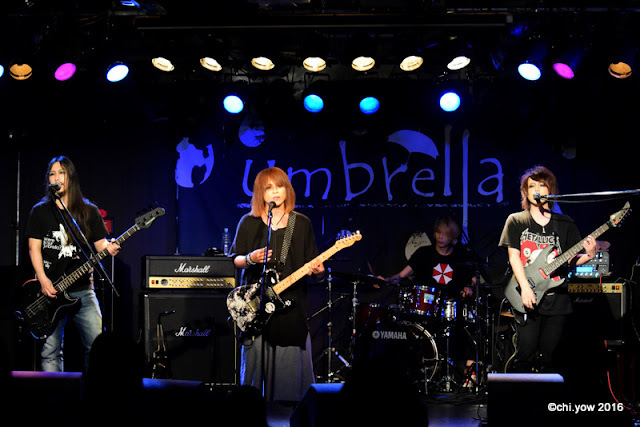 After the series of covers, umbrella followed up with their most recent single, with Yui beckoning everyone to come forth and add their voices to the chorus of "Alain." The combination of the low stage and limited space in the front due to the tables and chairs made for a grand effect as everyone's voices merged and resounded through the venue. “So…now what?” This query from Yui led to an immediate encore call from still-energetic fans. After some quick discussion, umbrella officially ended the night with a play of "Door," perhaps a bit symbolic of the closing of their Chapter.2 series of concerts, in order to open the next stage of their sixth anniversary year. Special thanks to Chi-Yow Lee for this live report and photos, and for umbrella for the opportunity!